challenge/command to the man "Zil G'mor!" (Go, learn it!) In Talmudic discussions, there is an often used phrase "Ta Sh'ma" (Come, hear it!) which introduces an earlier text into the discussion so that it can be analyzed as part of the inquiry. In each case, the directive could easily use just the second half of the phrase (i.e. "Learn it!" or "Hear it!") The words added at the beginning of each phrase teach us that all learning involves some kind of MOVEMENT (i.e. either "coming" or "going") - whether it be physical, spiritual, emotional or intellectual. we are never standing in the same place once we are through. The picture above is from Cutting My Hair in Jerusalem, Andrea Hodos' solo performance about learning in the Beit Midrash at the Pardes Institute for Jewish Studies. It depicts her journey to recapture and immerse herself in a textual tradition largely left behind by her family, while still maintaining the feminist perspectives with which she was raised. Many of the movements in her piece have names; the name of this movement -- "Satisfying Struggle." 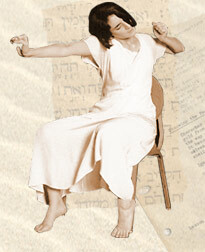 It depicts the constructive tension she felt sitting and learning in the Beit Midrash. This satisfying struggle leads Andrea through many different journeys -- many without even leaving her chair! Cutting My Hair in Jerusalem, along with Moving Torah Workshops and Performances allow audience members and participants to take a different kind of journey and see the text - and themselves - differently by the end of the process. To learn more about bringing this innovative work to your institution, click here.